Forget creamed spinach. 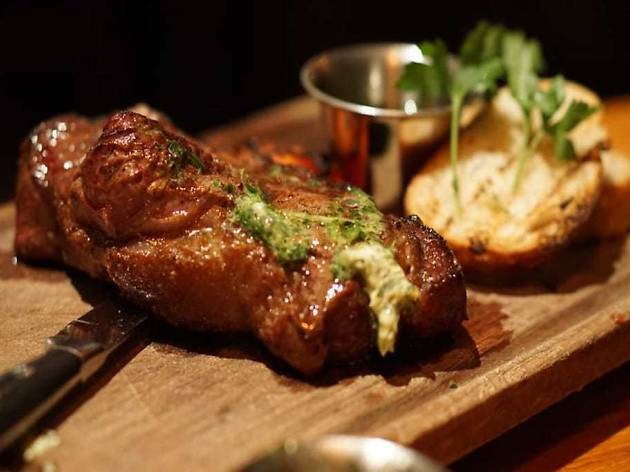 This five-year-old Argentinean steakhouse melds Latin American flavors with an ingredient-focused, farm-to-table NorCal vibe. The meat comes in myriad forms, but it’s all cooked over the wood-fired grill to a juicy char. 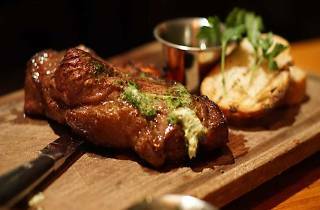 Options include the thinly sliced Entraña (skirt steak), Abuja (an 8-oz flat-iron steak), the Bife de Chorizo (New York steak), Ojo de Bife (ribeye steak), and the ultimate cut, the Gaucho: a thick, juicy, 26-ounce bone-in ribeye steak. They’re served alongside classic cocktails and vibrant, flavorful sides like papas—potatoes roasted to a crisp and topped with chimichurri butter—and pulpo, Spanish octopus served with potatoes and spicy mojo de ajo. If your appetite isn’t satisfied by steak alone, don’t miss the Hueso Asado: rich bone marrow served with jicama, crostini, and chile de arbor jelly. Picked this on a whim and did not regret it. Lovely atmosphere and beautiful restaurant. I didn't get a chance to go to the rooftop and only stayed for dinner. The food is actually not as expensive as you would have guessed. The small plates are great to share, especially the empanadas. I also recommend getting the skirt steak as a the main course. Loved everything about the restaurant!